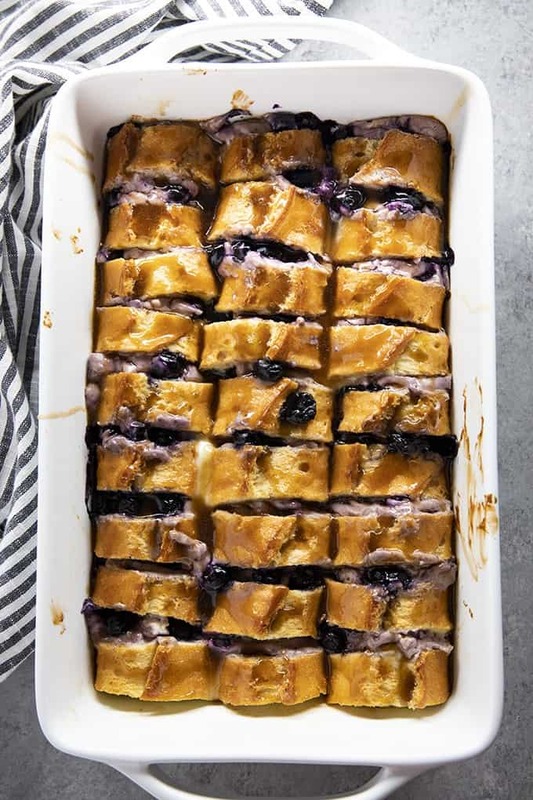 Overnight Blueberry French Toast Casserole is so easy to make ahead and then bake the next morning! 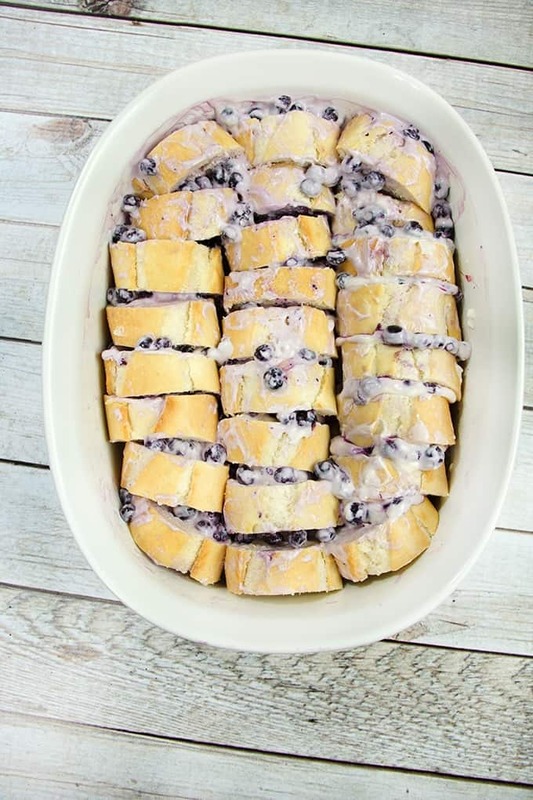 This french toast casserole is packed full of sweet cream cheese and blueberries! 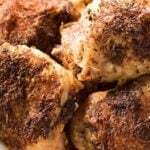 I originally posted this recipe back on December 12, 2016, and it immediately became one of the most popular recipes on my blog! 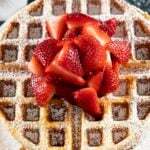 It was featured on Brit + CO Blueberry Breakfast Recipes amongst many other sites as well. And, with good reason, it’s SO delicious! While I have revamped some of the older pictures I kept a few of the originals too so that you can see how this casserole is assembled. I happen to love all of the overnight french toast recipes just like this Lemon Berry Overnight French Toast and my S’mores French Toast Casserole. It’s great to wake up on the weekend and be able to just pop your breakfast right in the oven and not have to do any work! 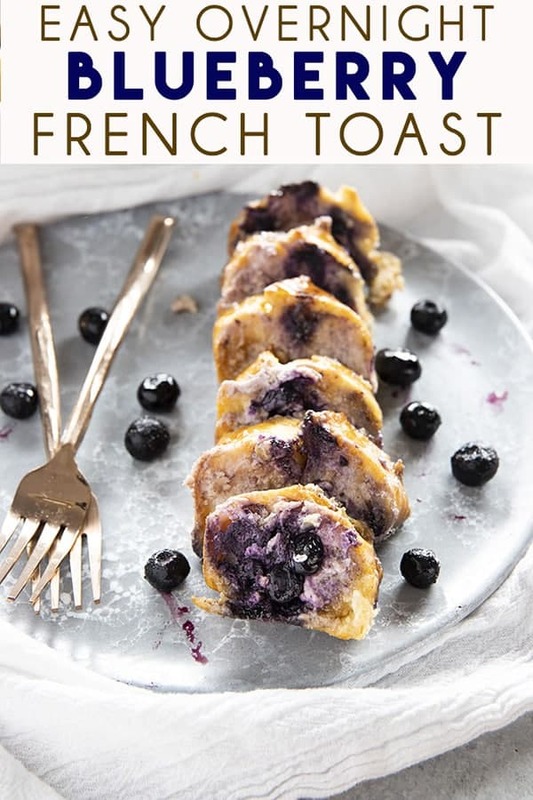 For this french toast casserole, you will start by slicing up two baguettes that are each about 12 inches long. Slice them into pieces that are about 1/2 – 1 inch thick. 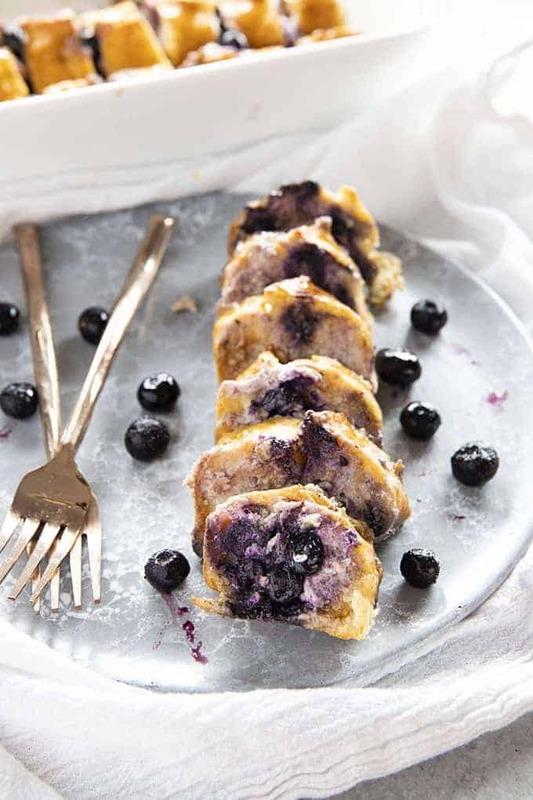 Set the bread aside and use a mixer to beat together the softened cream cheese with the maple syrup and cinnamon, then fold in the blueberries. You can use fresh or frozen blueberries for this recipe. 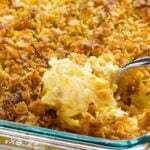 Now, butter a 9×13 or 3-quart casserole dish. Spread about 1 Tablespoon of the blueberry cream cheese mixture onto ONE side of each slice of bread. 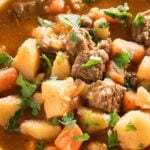 Layer them into your prepared casserole dish as shown in the picture below. 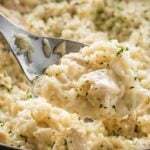 Next, whisk together your milk, eggs, and vanilla and pour evenly over the casserole. Press down slightly on the pieces of bread to make sure they really soak up that egg mixture. Cover and refrigerate at this point for at least 4 hours and overnight is best if possible. In the morning simply take this out of the refrigerator and bake in a 350-degree oven with the foil still on for 35 minutes. After the time is up, remove the foil and bake for an additional 10 minutes until the top is golden. 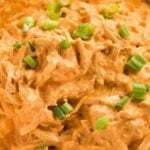 I recommend storing leftovers of this in the same pan in the refrigerator and re-heating in the oven. 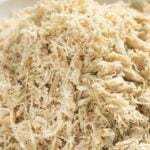 It’s best if consumed within two days after cooking. Lightly butter a 3 quart casserole dish. 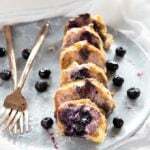 In a medium bowl using a hand mixer or large spoon, combine the cream cheese with the maple syrup, and cinnamon, then fold in the blueberries. Spread about one Tablespoon of the blueberry cream cheese mixture onto one side of each slice of bread. Place bread slices evenly in a row in the prepared baking dish. Use a glass measuring cup or medium bowl to whisk together the eggs, cream or milk, and vanilla extract. Pour mixture evenly over bread slices. Cover pan with foil and refrigerate at least 4 hours to overnight. (Overnight is best). Place the french toast in the oven with the foil on and bake for 35 minutes. Remove the foil and bake for an additional 10 minutes until top is golden brown. Melt butter in a small saucepan over medium heat. Whisk in the brown sugar until smooth. Whisk in the maple syrup and cinnamon. Drizzle over french toast as desired. NOTE: Fresh or frozen blueberries can be used for this recipe. Do you think you could make this and substitute strawberries for the blueberries? I want to make 2 and have a second option. Hi – can you freeze the leftovers? If using frozen berries, should they be thawed before adding them to the cream cheese? Thanks for the recipe. I am bringing this for a potluck. Should I add the topping prior to serving or should it be put on the side so guests can decide on degree of sweetness? Hi, I’m wondering if the glaze/topping can be made ahead of time, or the night before and then refrigerated? I prep this for my parents and don’t want to leave extra work for them to do. What length baguette did you use . I see different sizes, from 12 to 21 inches ! Thank you. I’ve made this ahead of time – so can I bake it and then reheat it on the second day? Hi! Yes, you can bake it and then reheat it in the oven. Would half and half work well for this? Made this last night for breakfast today. My kids loved it! The only thing I did differently was added a splash of almond extract. Will be making again! Google says that a 9 x 13 Casserole dish is 3 Quarts – so do I really need to double this recipe for a 9 x 13 dish? Did you get an answer for this? I was wanting to make a 9X13 size and didn’t know if I should double? Love food as much as we do?